Lee Min Ho and Park Shin Hye's characters in Heirs are driving me crazy! I always think what will happen to them. What will she do after the kiss? What will he do after she confess? Oh yes the story seems to be the usual one but the characters makes it very unique from other dramas. And Eun Sang, she acts like what a typical and normal girl would do in real life you know. Especially to someone who has no time for love. She would definitely reject or ignore the handsome, smart, rich and hot Kim Tan if she's going through too many things. She could not afford to make her life more difficult. No matter how 'perfect' he is, if you know that it wouldn't do you any good thing then you would definitely ignore it right? I still hope that this two will find a way to make things better for both of them. Tan I believe in you, i know you wouldn't just give up on Eun Sang no matter what happens. Eun Sang ah~ I hope you'll find a reason to accept Kim Tan's feelings and be happy with him! To my beloved Min Ho oppa and Shin Hye unnie~ You are so amazing that I sometimes forgot what your real name is and thought that you are really Eun Sang and Kim Tan and real life (hahahaha just kidding ) I just want to say that both of you are amazing actors and doing this drama together is a smart choice for both of you. Sulli Minho said: Lee Min Ho and Park Shin Hye's characters in Heirs are driving me crazy! I always think what will happen to them. What will she do after the kiss? What will he do after she confess? Oh yes the story seems to be the usual one but the characters makes it very unique from other dramas. 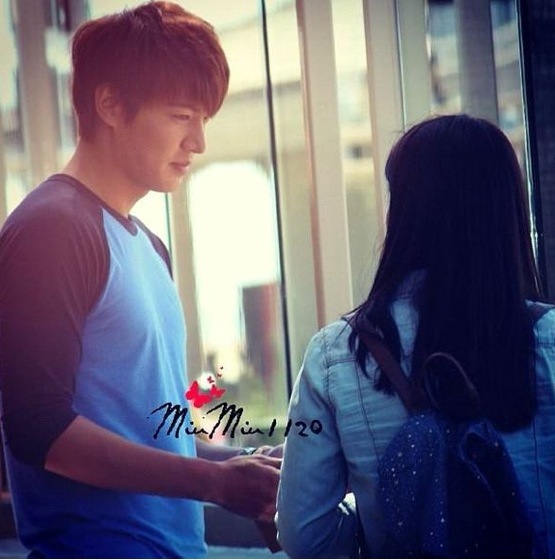 Tin Nguyen said: Sulli Minho said: Lee Min Ho and Park Shin Hye's characters in Heirs are driving me crazy! I always think what will happen to them. What will she do after the kiss? What will he do after she confess? Oh yes the story seems to be the usual one but the characters makes it very unique from other dramas. I'm rooting for KT and ES too. I think YD's fate is meant to be a friend for life to KT and ES. YD will meet his awesome other half later on in his life. Yes I agree that LMH and PSH are suited to play a more matured teens. Waiting for the rest of the series to unfold to see if LMH and PSH can act out the passionate part, but I have a feeling that won't happen unless there's a time skip in the last couple of episodes. 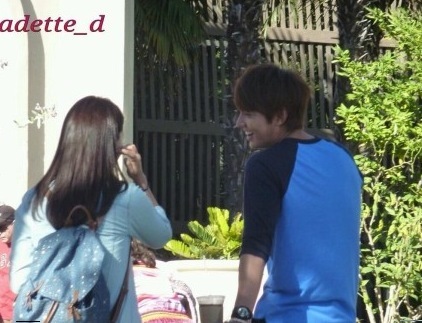 :x LMH lending PSH his jacket.. so gentleman and sweet..
@ravairie.. Thanks for those BTS! Always love seeing the ones in LA. It has a different feel. Are they teasing us by releasing BTS of ES wearing a night gown and Tan having dinner?! Shipper's heart - Minho to Shinhye: As if we fall in love for real?...:-! 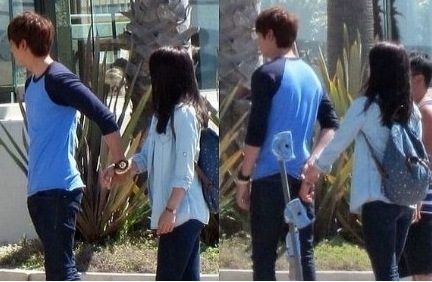 I did not find the line Kim Woo Bin + Park Shin Hye. How to create this line? 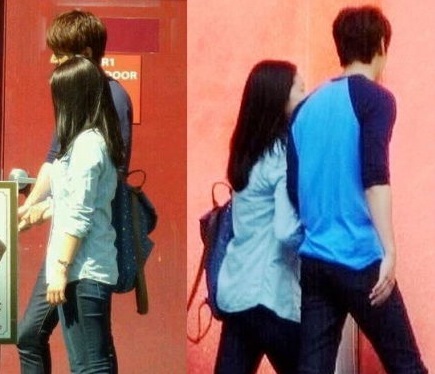 BTS pics of LMH and PSH reminds me of the bts pics of Nicky Wu and Liu Shi Shi from Bu Bu Jing Xin / Scarlet Heart. In one of the interviews PSH said that since she's past 23yrs, she'll like to get married to a kind man before she's 30 years. LMH's eyes dilated and were all shiny after he heard PSH say that (check out the pic in Heirs forum). They're both young and there's no need to rush to be officially together. 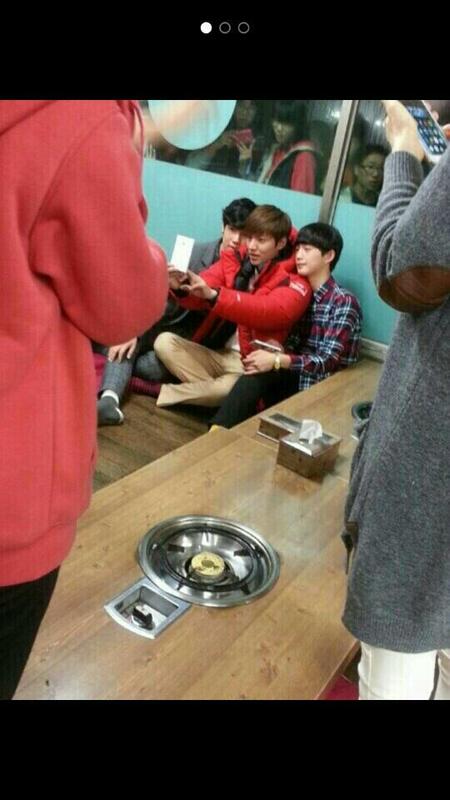 But I wouldn't be surprised to see pics of LMH and PSH meeting together on days off when LMH is in the army. Enonane1 . said: Even though I am in US I have never watched Gossip Girl so have been wondering if it would help if I watched it now?I have said it before and will say it again - LMH and PSH are the only ones that could have acted the roles of KT and ES simply because there are no other actor or actress that speak with their eyes like these 2 can.....and this story wouldn't be half as poignant and heart wrenching if we didn't have all the eye conversation going on.....these 2 don't need to do a lot of talking because their body language and eye conversation says and shows every emotion so plainly.....I am so enjoying watching these 2 and am enjoying how well they have slipped into the roles of ES and KT....I know they work hard to give us their best of the characters and I know they have succeeded when it seems as if the characters are real and there are no actor/actress involved!